I’d like to take this opportunity to extend a personal invitation for you to join us for Ligonier Ministries’ 2014 Alaska Cruise from May 30 through June 6, 2014. This promises to be an exciting time of fellowship and study as we consider the truths of Scripture and enjoy God’s magnificent creation together. Drs. Michael Morales and R.C. Sproul Jr. will be joining us as we set sail on May 30 from Seattle, Washington. Over the course of our time together, we will visit the ports of Ketchikan, Juneau, and Skagway, Alaska, as well as Victoria, British Columbia. 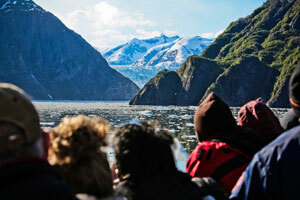 We will view the ice formations and wildlife of the Tracy Arm Fjord and the Inside Passage, and there will be time for many day trips as well at each port of call. I hope that you will consider joining us for this relaxing and edifying trip. Thank you. Click here for more information, or to register please click here or call Sovereign Cruises toll-free at 877-768-2784, ext 101. Let the Reader Understand by R.C. Sproul Jr.
Submission and Application by R.C. Sproul Jr. In addition to the study cruise messages, R.C. Sproul will preach during a church service and there will be two sessions dedicated to questions & answers. Learn more about the speakers and the study cruise schedule. Those who cruise with us will receive complimentary registration to our 2014 West Coast Conference in Seattle on June 6-7 immediately after the cruise. Drs. Steven Lawson, Stephen Meyer, Albert Mohler, R.C. Sproul, and R.C. Sproul Jr. will speak on “Overcoming the World”. Learn more.